homeless gutter punks loitering regularly late at night on the sidewalk. Littering on property is an order of magnitude greater than across the road. It's fine to report a nuisance like this, but what exactly does the hate speech add? Hate speech? I'm not seeing it. It's descriptive. What people report it to the One Point of Contact on PDXReporter.org, it shows a dot on their map but they don't post descriptions. I think descriptions are great since they add who(gutter punks), what(liquor law violation) , when(late at night), why(likely because of alcohol availability and bottle return at Plaid Pantry) to the where information. Something needs to be done about this spot. Police were dispatched eight times to this block range this month one of which was for robbery with weapon. Graffiti constantly popping up on building indicating gang activity and syringe caps on Plaid's property once in a while. Portland Firefighters Park has become a chronic blightened property due to homeless activity, their trash, and criminal activities related. It has been essentially taken over by transients and vagrants. The mural is covered in unsightly tagger graffiti and it has become a blighted property, because they have been accumulating for months. Out of town vagrants living in a green pickup truck with CALIFORNIA PLATES full of junk for at least a few days on west side of Larrabee right before Broadway bridge. There's a homeless camp in an alley property adjacent to Plaid Pantry 114. People who have visited the store/OLCC licensee 284163 to cash cans have been seen trespassing into this bicycle chop shop . Several barbecue propane tanks are there, bums are running a gasoline generator, etc. There's a tarp structure/tent in the SW corner of Going/Interstate intsection. A handful of 20 something male transients with skateboards were seen loitering about the encampment in pre-dawn hours. 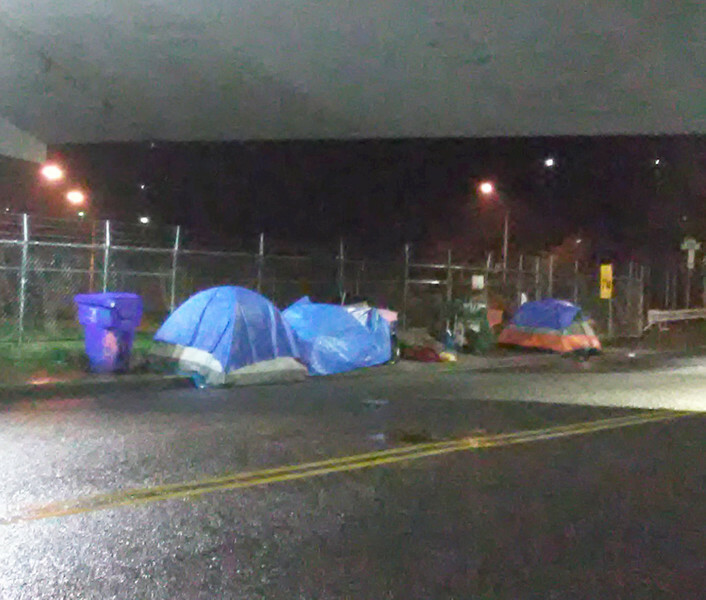 There are a handful of tents and a herd of transients on the sidewalk on SW Montgomery St between SW 12th and SW 13th. Clean for now, but given the pattern by City of Portland's permissive management approach that allows problems to reoccur repeatedly in locations known to have problems, it's only a matter of time before it happens.. and then I will reopen the issue WHEN that time comes. "Infestation relapse". Is this really necessary? The practice of referring to humans as animals or insects has a tragic history. You're free to say whatever cruel or hurtful things you want, but it is possible to report problems without using dehumanizing, exterminationist language. There has been a total of 68 graffiti complaints in ParkScan for the entire city in the past year. 48 of them were for this park; or 70% of city wide park related graffiti complaints. Something needs to be done to be done deal with chronic malicious mischief at this park. Contributing factor to this is the blighted property next door which is the non-profit agency Metropolitan Family Service. Tolerating this kind of damage is unacceptable and is an unnecessary drain on parks budget.